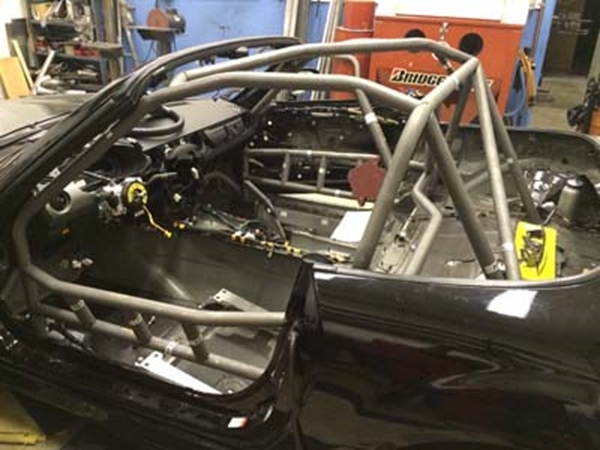 MiataCage is now offering a roll cage kit for the 2006 to 2015 Mazda MX5 Miata. Designed just like our 90-05 kits it offers the most room possible in the car while protecting the occupants. This kit however if FULLY coped and ready for install. Minimal fitting required and comes with 2 templates that bolt to the car for proper placement of the main hoop. Once the main hoop is placed properly then all other tubes will fit into their proper position. Since all tubes are fully coped the installation time is 10 to 12 hours less than having to notch all tubes and can easily be completed in 2 days by a skilled welder. The price includes Free ground shipping via UPS anywhere in the continental US. Laser cut and formed landing plates (10). Weld into place with no modifications. 1” tube gussets and landing plates all included. Main Hoop locator bracket - This is a bolt in bracket to align the main hoop in the car for the proper position since all other tubes key off of the main hoop. Fully notched kit. All tubes are fully notched/coped and ready for installation. Having the kit fully notched reduces the installation time by over 10 hours. Computer controlled bending ensuring accurate bends every time. Every piece is marked with a part # that corresponds to 4 separate full page schematics. Rear down tubes land next to shock mounts. When installed properly less than 1/4 inch of clearance to roof allowing for more head room for taller drivers. Includes Nascar door bars on both drivers and passenger sides installed at an angle that provide the driver with added safety in the event of a side impact. Allows for stock passenger seat to be reinstalled once complete. Kill Switch Plate for passenger side main hoop area. MX5 Cup Kit also available.